Note to Meadow Walk residents: Hopefully you spotted our “save the date” email a few weeks ago. If not, please contact us to make sure your contact info is up to date. It’s time for our annual community-wide garage sale! As in previous years, we’ve coordinated with Palmer Glen and The Enclaves, so we expect a decent amount of traffic coming through. The event will run from 8am to 1pm. 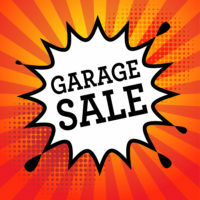 It’s a great time to get rid of all the junk that you moved into the garage during your Spring Cleaning!